I’ve joined a new blogging event called Baking Bloggers. Sue of Palatable Pastimes is our host and our first theme is pie! 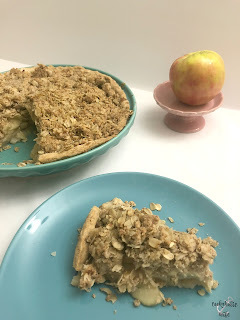 I’m one of those people who prefers pie to cake, but for some reason I don’t make nearly enough of them, but I knew I needed to find the perfect one to make for this event. Which turned out to be pretty easy, since I looked at my overflowing fruit basket and found tons of apples and a few pears that needed to be used up. 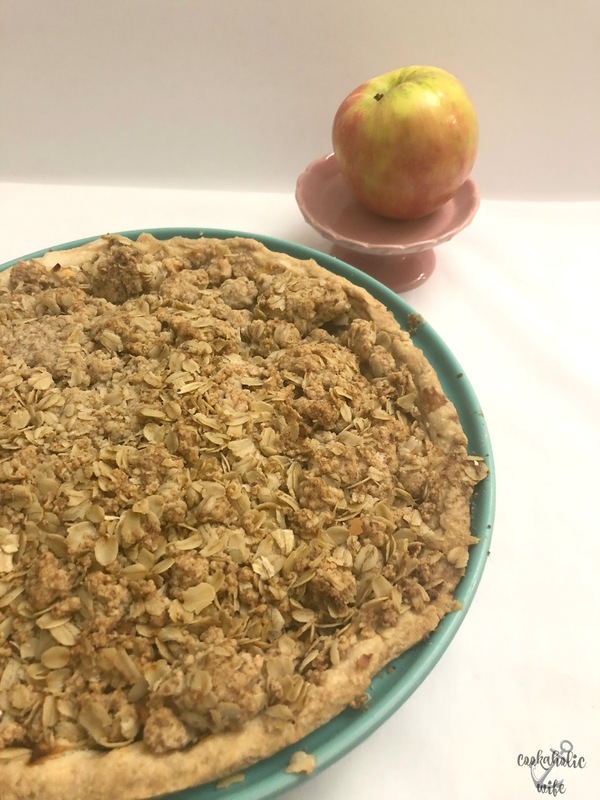 I have a huge love affair going on with ginger lately and I couldn’t pass up adding it, along with other traditional fall spices, to this pie. I think the combination added just enough to leave people wondering what other than cinnamon was included. A pear and apple pie topped with a hearty crumble. 1. Preheat the oven to 400 degrees. Roll pie dough over a 9-inch deep-dish pie plate. 2. Dock the dough (prick with a fork) and blind bake for 10 minutes or until lightly golden. 3. Meanwhile, in a large bowl, toss the apples and pears with sugar, cinnamon, nutmeg and ginger. Transfer the apple mixture into a colander placed over a large bowl. 4. In a medium bowl, prepare the crumble by adding the oats, brown sugar, flour and salt. Use a fork or pastry cutter to cut in the butter until the butter is blended in and the mixture is clumpy. 5. 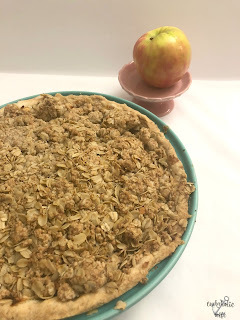 Use a slotted spoon to transfer the apple mixture into the pre-baked pie crust, draining excess liquid. 6. Pile the crumble on top of the apples, pressing down into them gently to create a mound of the crumble topping. 7. Line a baking sheet with foil and place on the bottom rack of the oven to catch any drips if the pie cooks over. Reduce the temperature to 375 degrees. 8. Place the pie on the top shelf of the oven and bake for 1 hour and 15 minutes. Check on the pie after 45 minutes and tent the top with foil if it is browning too quickly. 9. Transfer to a wire rack to cool before slicing and serving. You can never go wrong with an apple pie and this one definitely does not disappoint. 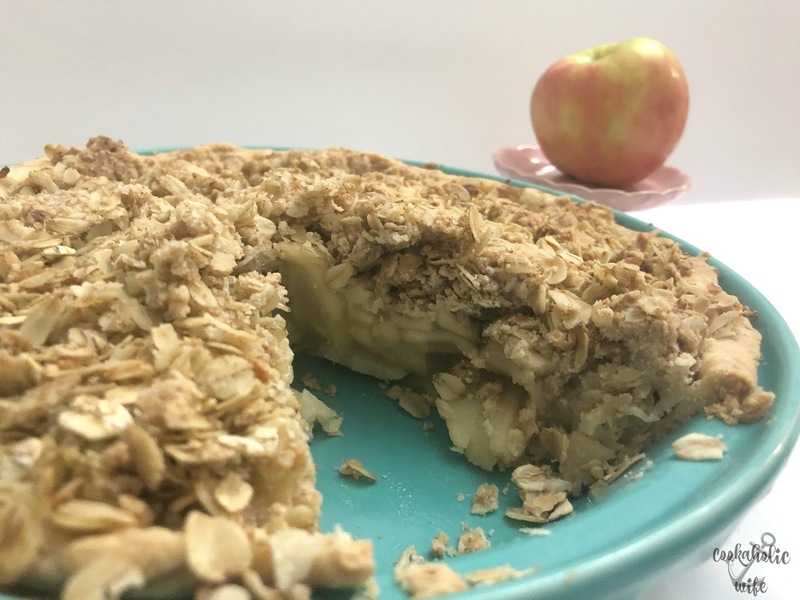 Piled high with apples and covered in a flavorful oat crumble, I dare you to only eat one slice. Check out what everyone else made! I too prefer pies to cakes! Anytime! 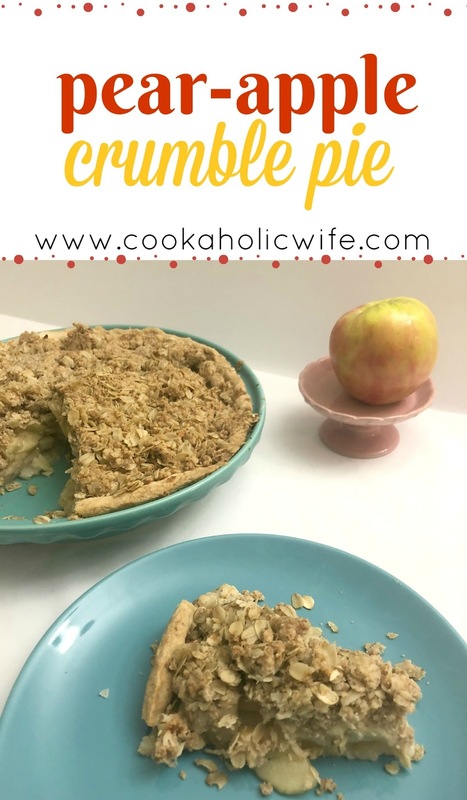 🙂 This crumble pie looks so yum! I love that you also used pears in it! Those oats crumbled on top look wonderful. What a wonderful flavor combination. Love the look of the crumb topping on this one! Thanks for joining in this month. Oh this pie is right up my alley Nichole. I think pears are so greatly underused and underappreciated.